The first thing I wanted to do when we arrived in Cairns was the ride the Kuranda Scenic Rail up through Baron Gorge, and then ride the Skyrail Rainforest Cableway back down over the rainforest of Macalister Range. We parked our car at the Skyrail terminal where our coach awaited to transport us to the Freshwater Railway Station. We had enough time to enjoy a walk through the museum before boarding the train and stepping back in time injected the air with a little element of magic. Not our carriage, but part of the museum. I was on the lookout for Harry, Ron, and Hermione. 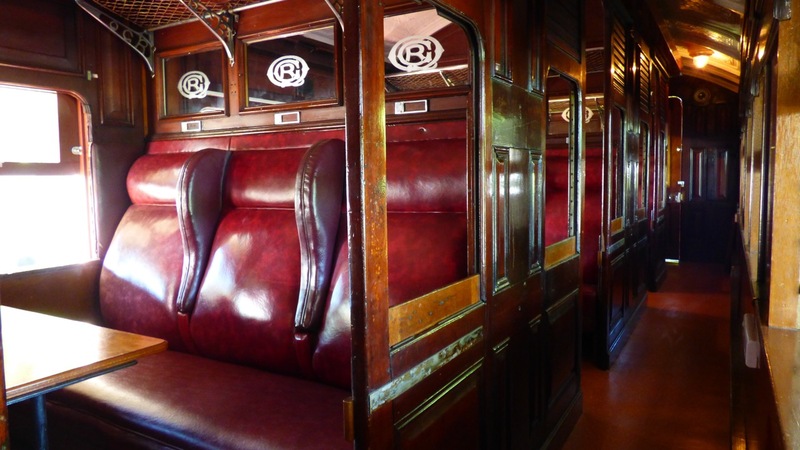 Our carriage was also wooden but not so luxurious as the one on display. At least we had opened windows allowing Mother Nature’s air conditioning to keep us cool during the ride up the range and through Baron Gorge National Park. After enjoying lunch at the Kuranda Hotel, we walked around, visited the markets, and eventually made our way to the Skyrail terminal. Seating a maximum of six passengers at a time, there are 117 gondolas on a continuous loop, traversing 7.5 kilometres (4.1 miles) across Macalister Range at a leisurely speed of five metres per second (16.4 feet per second). That might sound fast, but it didn’t feel as though the trip was over all too soon. We sat back and enjoyed the ride down the range and across the top of the rainforest. There was one moment when the wind struck from the east, but for once I didn’t panic. The ride was peaceful. We had a gondola to ourselves and really enjoyed the tranquillity of simply sitting there watching everything go by. I could easily have turned around and ridden back up to the top again, just to enjoy the ride back down anew. When I was 12 years old and about to start high school, our entire class had a weekend away. It was not unusual to go on a school excursion, but this was different. We boarded a train in Townsville late one Friday night, arrived in Cairns just in time to enjoy some breakfast before boarding the Kuranda Scenic Rail. In Kuranda a bus awaited to take us on a tour of the Atherton Tablelands, before taking us back to Cairns where we once again boarded a train for the return trip to Townsville. It wasn’t much of an outing time wise (less than 48 hours), but it left a lasting impression on me. It was a pleasure to retrace part of that memorable journey. After Dean and I have been to the Daintree and Cooktown, we’ll spend time on the tablelands where I intend retracing other steps taken more than half a lifetime ago. Hi Clare – I missed opening this one until just now….Takes my mind back quite sometime but I remember just how stunning the scenery was – the train was my favourite. I’m sure you would have had a fun time…missing you!! We did enjoy our day out Denise. Miss you too. Oh How I love a train. We went on one in Skagway, Alaska. Loved every minute of it. It bought back so many happy memories for me, and it was lovely to do the ride again as an adult. Looks like you and Dad had a great time Mum! Such a nice way to see it all! I love reading about your travels. I’ve learned so much from your blog. Thank you. Thank you Suzi, I really enjoy writing about where our travels take us and it makes me smile to know you love reading about what we get up to.